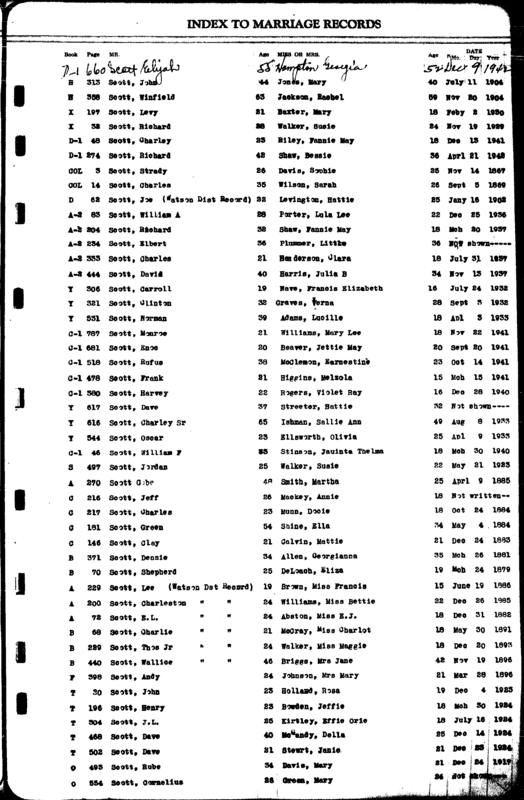 The following are historical documents relating to the Harper, Varden and Privett/Privette families in Arkansas. 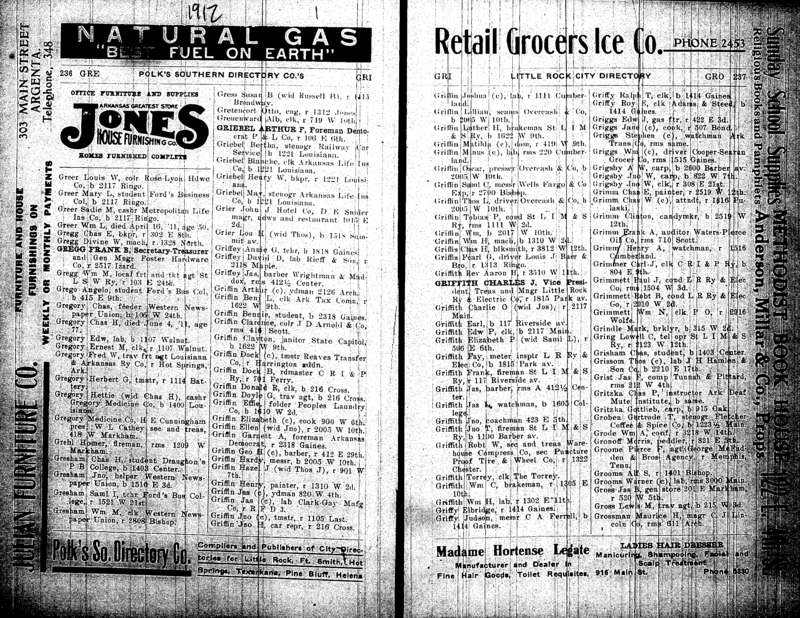 Click on thumbnails to see full-sized document. 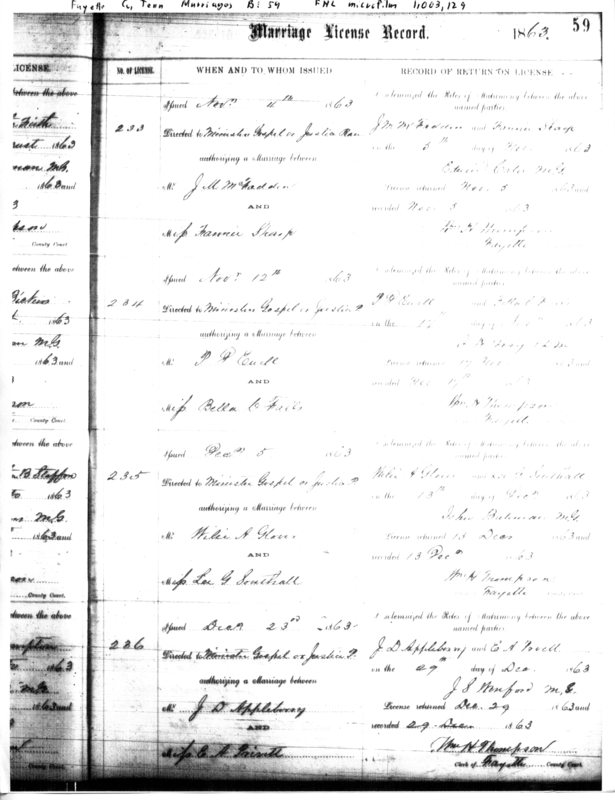 1850 Census: Little B. Privette (great-grandfather of Frank Privett, age 29) is shown living in Fayette County, Tennessee with his wife, Mary (age 25) and four children: Elizabeth (age 7), Matilda (age 6), William F. (age 2, grandfather of Frank Privett) and Martha (5 months). 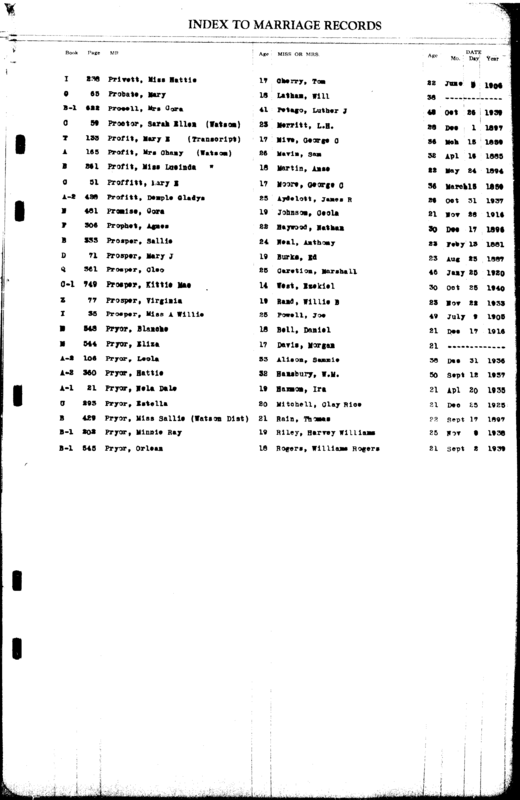 This is the earliest record I currently have of the Privetts and is incorrectly indexed as "Little B Prinster". 1860 Census: Mary Privette (great-grandmother of Frank Privett, age 40) is shown still living in Fayette County, Tennessee with five children: Eliza Ann (age 19), Matilda (age 17), Francis (aka. William Francis, grandfather of Frank Privett, age 15), Martha (age 13) and Berry (age 11). Little B. Privette (great-grandfather of Frank Privett) apparently passed away (or left the family) between 1850 and 1860. This record is incorrectly indexed as "Mary Prinet". 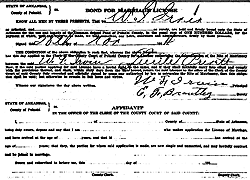 1863 Privette/Appleberry Marriage License: Matilda J. Privette (great-aunt of Frank Privett) is shown marrying R. G. Appleberry in Fayette County on January 18, 1863, officiated by William A. Cothran. 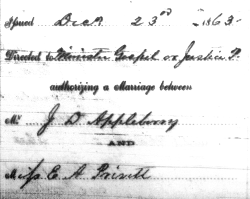 1863 Privette/Appleberry Marriage License: Eliza Ann Privette (great-aunt of Frank Privett) is shown marrying J. D. Appleberry in Fayette County on December 29, 1863, officiated by J.S. Monford. Presumably, J.D. is the brother of R.G. Appleberry, who married Eliza's sister earlier in the year. Mary Privette (Eliza's Mother) is shown living with this couple in 1900. 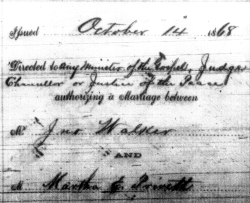 1868 Privette/Walker Marriage License: Martha E. Privette (great-aunt of Frank Privett) is shown marrying John Walker in Fayette County on October 21, 1868, officiated by William A. Cothran (the same minister that officiated the wedding of her sister Matilda). The Walker family became intertwined with the Privette family at this point. In 1870, Martha's widowed mother, Mary Privette, were living with this couple. In 1900, Willie and Hattie (Addie) Privette (uncle/aunt of Frank Privett, grandchildren of Mary Privette) were living with Maggie Walker and an elderly, widowed John Walker. Bill Privett (son of Frank Privett) remembers Ruth Walker, a friend or relative of Frank Privett, coming to visit the Privetts in Salem, MO. Joan Privett Minn (daughter of Frank Privett) recalls a J.W. Privett coming to visit the family, who may have been John Walker, Jr. Regardless, we can probably safely assume that these Walkers were somehow related to John and Martha Walker. 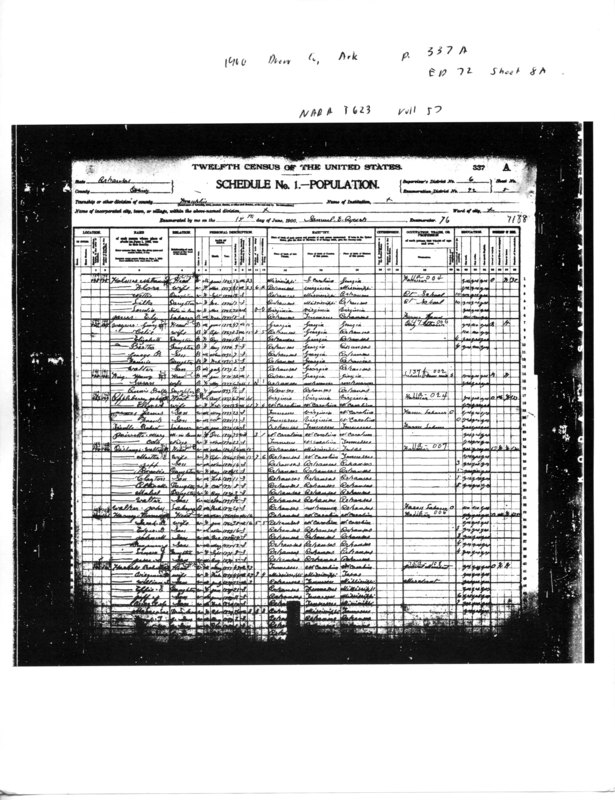 1870 Census: Mary Privette (age 45, great-grandmother of Frank Privett) is shown as head-of-household in Fayette County, Tennessee, living with her daughter, Martha (age 21), Martha's husband John Walker (age 34), and the Walker's 9-month-old daughter Florence. Two of Mary's sons, Francis (age 22, grandfather of Frank Privett) and Berry (age 17) also live in the residence and work as farmers. 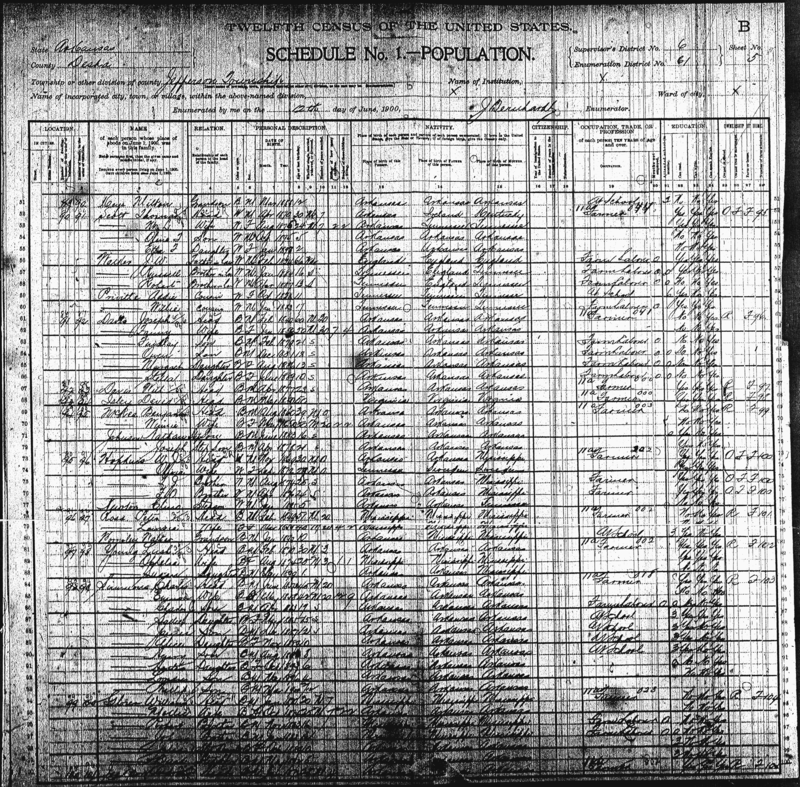 1880 Census: Mary Privette (age 53, great-grandmother of Frank Privett) is shown living in Fayette County, Tennessee with John and Martha Walker and their four children: Addie (age 11), John Jr. (age 9), Maggie (age 7), and Emmet (age 2). 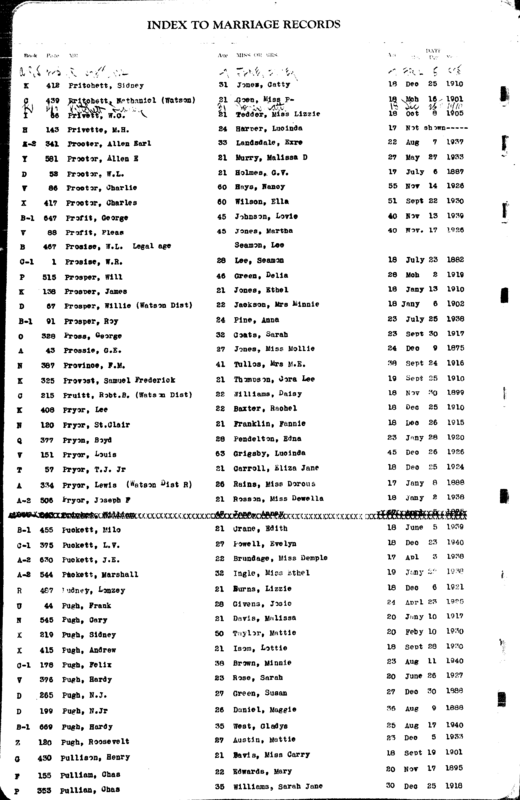 Record is incorrectly indexed as "Mary Prevetti". 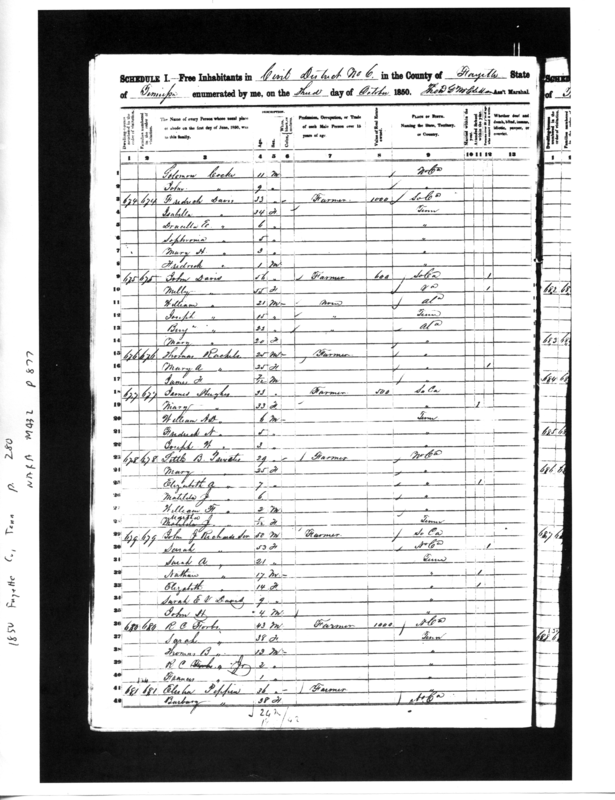 1880 Census: William Privette (age 32, grandfather of Frank Privett) is shown living with his wife, Mollie (age 19) and their three children: Clarence (age 3), Marion (aka. Herman, father of Frank Privett, age 2) and cloee (age 7 months). 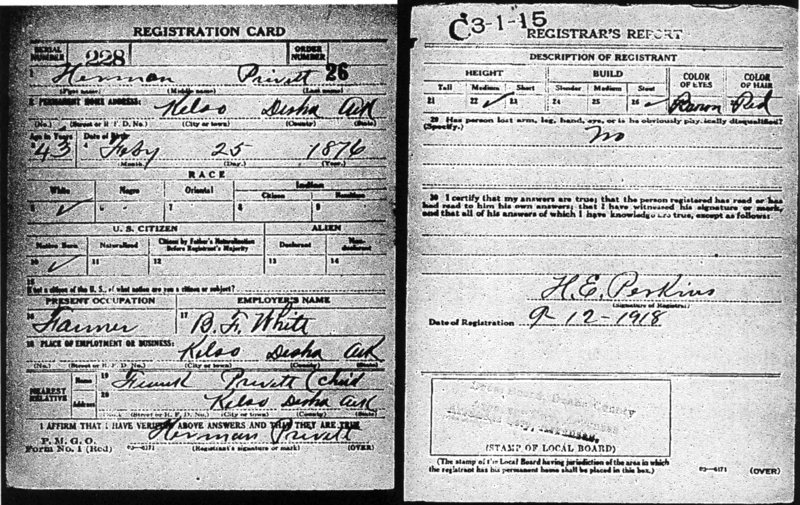 This is the last record I have for William Privette and with their last child, Hattie (Addie), born in 1888, it is likely that William and/or Mollie died sometime between 1888 and 1900. 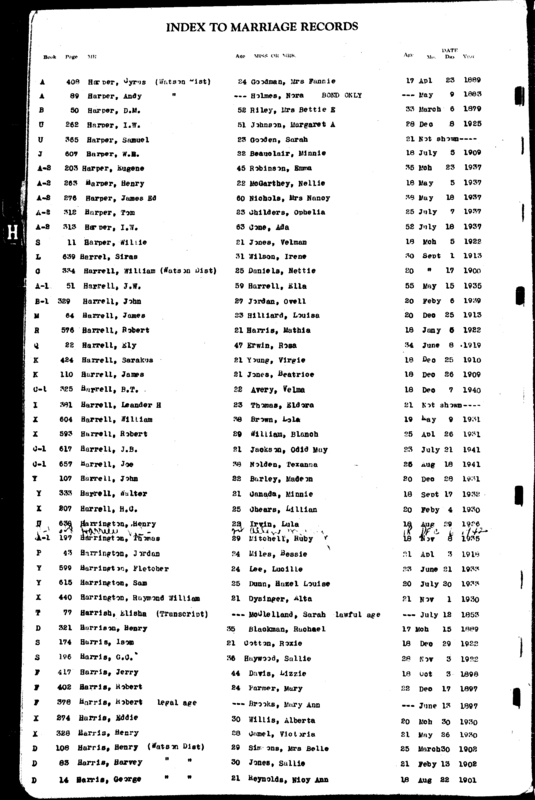 Record is incorrectly indexed as "William Prewette". 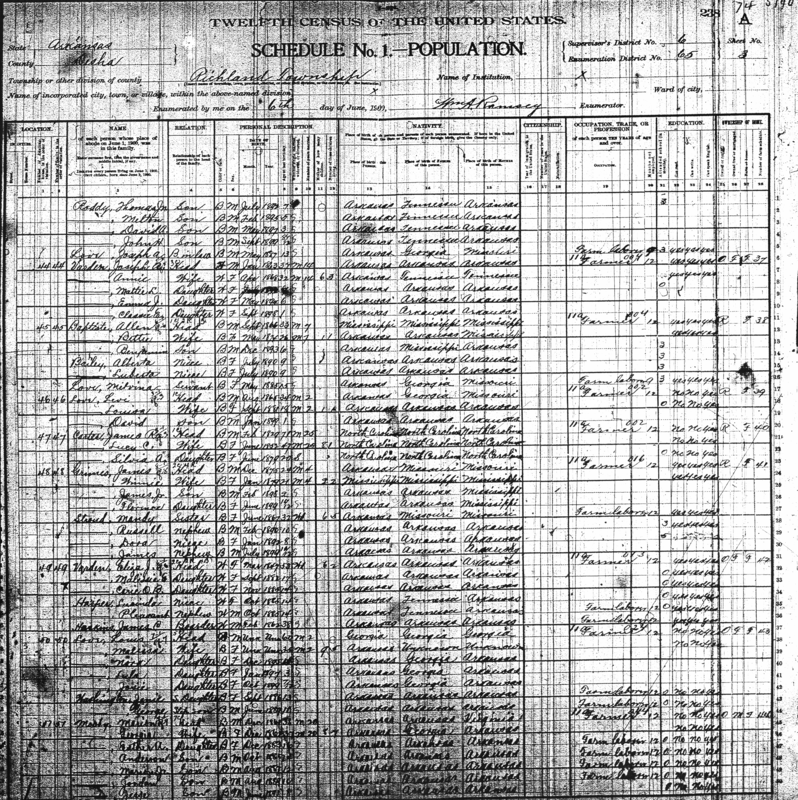 1880 Census: Eliza Varden was the aunt in Richland Township (Desha County) that took in Lucinda Harper (Frank Privett's mother), reputedly after Lucinda had been orphaned. 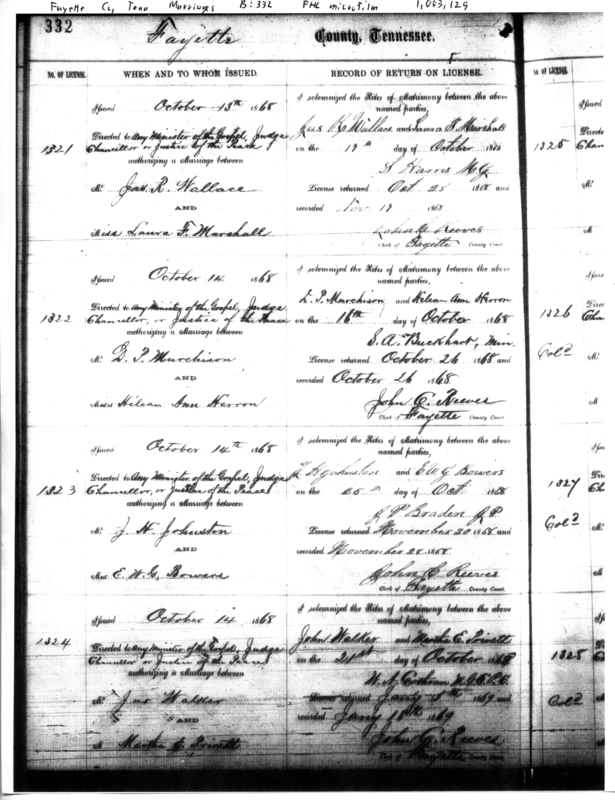 This is a census record from 1880 showing an Eliza Varden (age 35) living in Kelso with her husband William (age 49) and five(!) children: Mary (age 18), Joseph (age 17), Jarris (? age 12), Eula Lee (? age 5), and Henrietta (age 3). 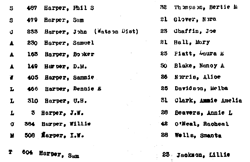 Desha County Marriage Index - Harper: The names and origins of Lucinda Harper's parents (Frank Privett's grandparents) are uncertain, although it is possible that one of couples on this list of Harper men married in Desha County may be her parents. 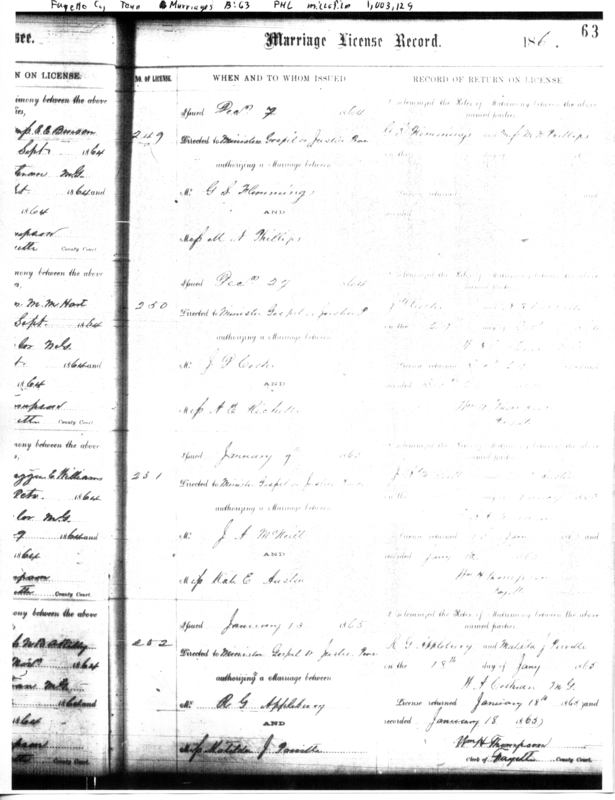 1887 - Desha County Marriage Index - Varden: The familial connection between Eliza Varden and Lucinda Harper is not clear. Since the relationship specified in the 1900 Census is "neice", Eliza Varden was presumably the sister of Lucinda Harper's mother or father. 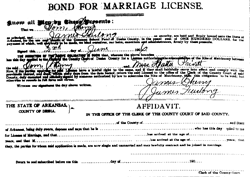 Although it is an unlikely (and possibly misleading) hint, there is a marriage listed in Desha County between a 23-year-old Joseph Varden (Eliza's son) and Annie Harper (age 18) on 1/21/1887. Annie Harper may have been Lucinda Harper's sister (i.e. Frank Privett's aunt). Lucinda is almost certainly not Joseph and Annie's child since the couple is listed in the 1900 Census as living with a family of their own just up the street from Joseph's widowed mother, Eliza Varden, and Lucinda Harper. 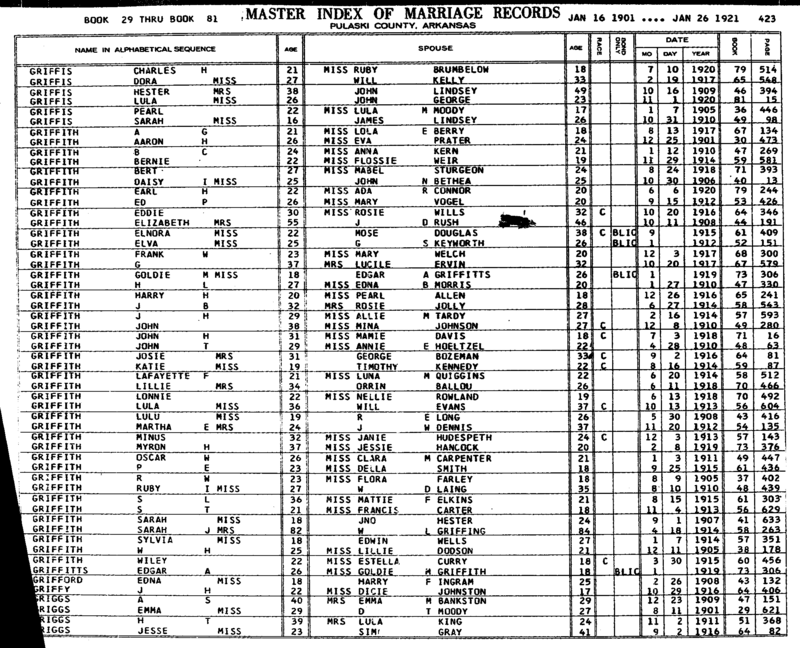 1893 - Desha County Marriage Index: Shows Thomas Scott, Jr. and Maggie Walker being married on 12/20/1893. 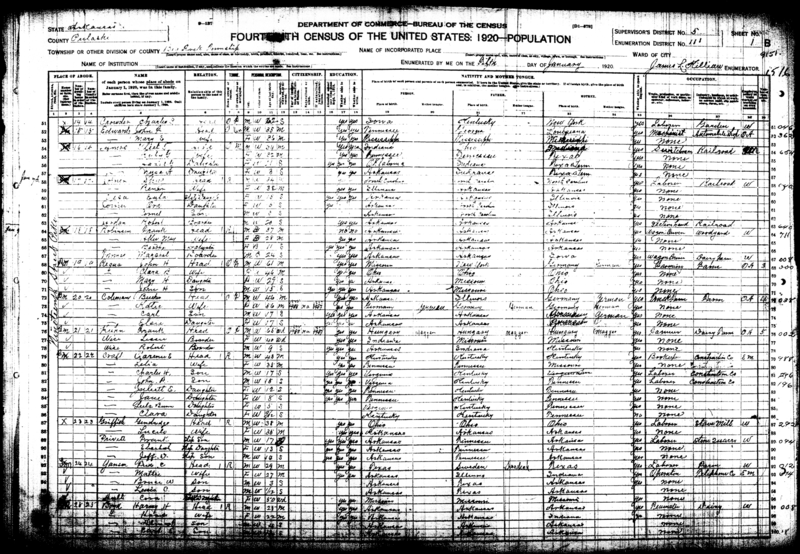 Walker is shown in the 1900 census simply as M.L. Scott, and this confirms her maiden name is Walker and not Privett. 1900 Census: Lucinda Harper (Frank Privett's mother) is shown living in Kelso with her aunt, Eliza Varden (age 55), and twin brother, Pleasant Harper (age 14). 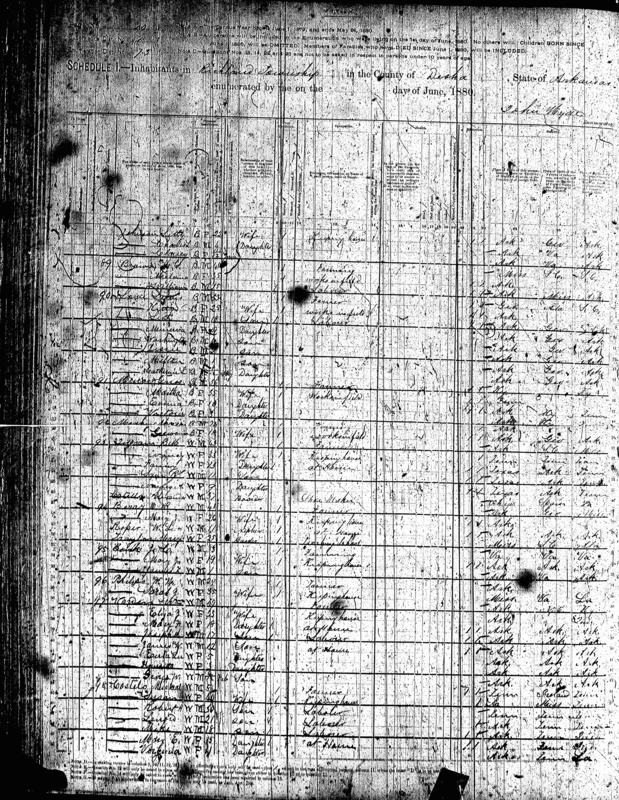 The record also shows her son, Joseph Varden (age 37), living up the street with his wife, Annie (possibly Lucinda Harper's sister) and two children. 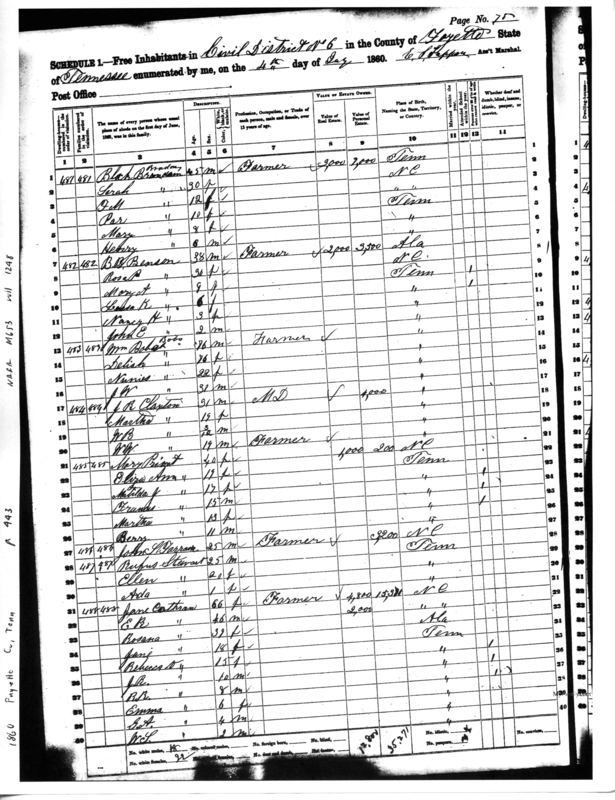 1900 Census: Frank Privett's uncle/aunt (Herman Privett's siblings) Willie Privett (age 17) and Hattie (Addie) Privett (age 11) are shown living in Desha County, Jefferson Township with their cousin, Thomas Scott, Jr. (age 30). Scott's wife, Maggie Walker, was the daughter of John Walker (the 66-year-old widowed father-in-law in this household) and Martha Privette. Martha Privette was the daughter of Little and Mary Privette, the grandparents of Willie, Hattie and Herman (Frank's father). 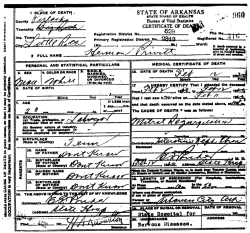 1900 Census: Mary Privette (age 75) is shown living in Drew County, Arkansas with her daughter, Eliza Ann Appleberry (age 58), son-in-law John Appleberry (age 67) and two of the Appleberry Children: James (age 23) and Francis (age 17). This record was the key to finding Marion Herman Privett's parents. This is the final record I have for Mary Privette and we can probably safely assume that she passed away between 1900 and 1910. 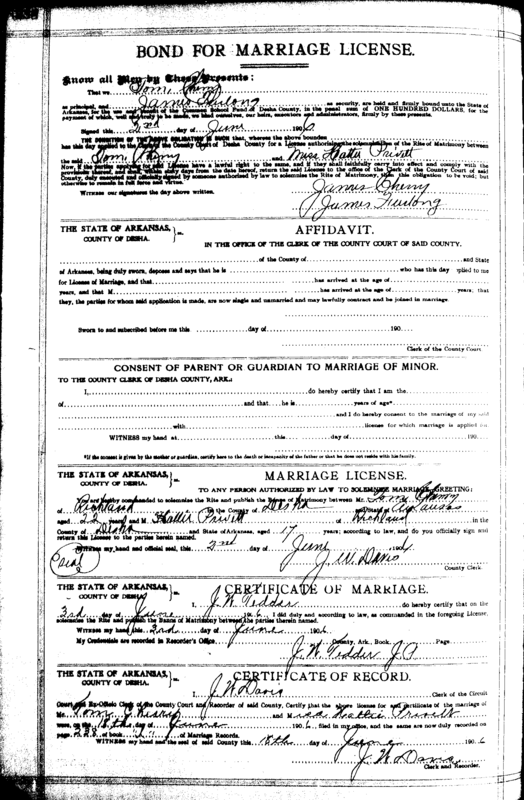 1903 Herman Privett / Lucille Harper Marriage License: This is the first official record I can find of Herman Privett's existence. The first interesting note about this record is that his name is given as M.H. 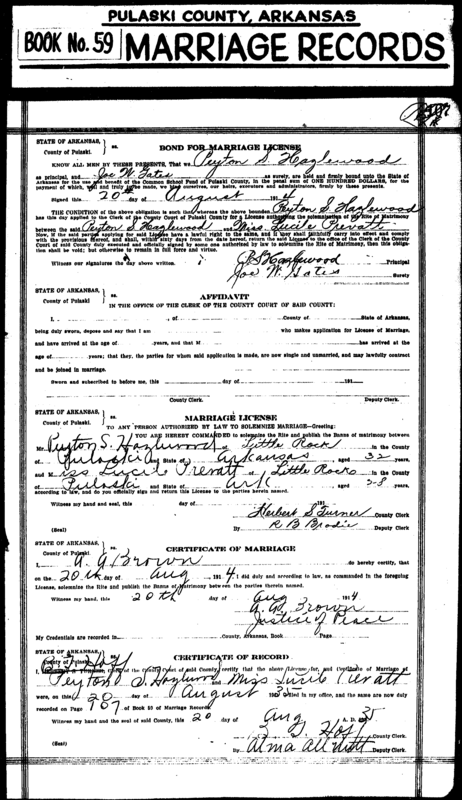 Privette, with an spelling for the last name that differs from the 1900 census record for his siblings and with an indication that Herman was his middle rather than first name. 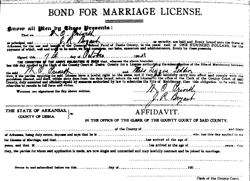 Also, although the license was issued on 2/14/1903, the section for when the marriage was actually performed is left blank. 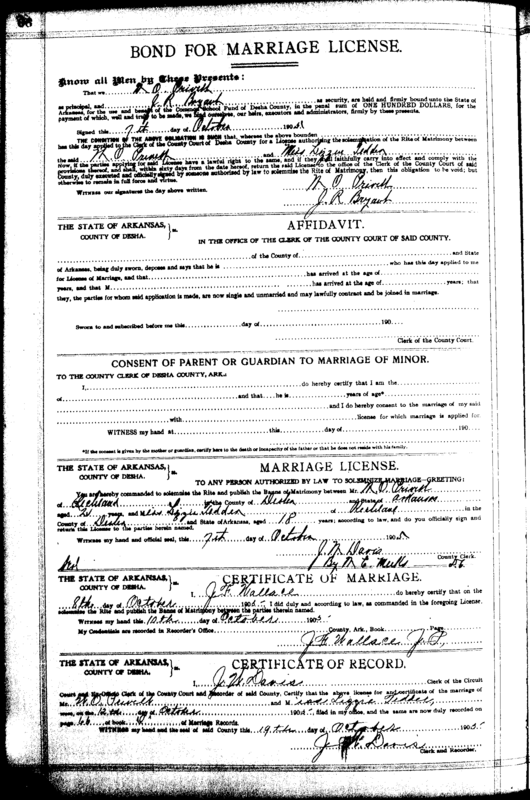 1905 William Privett / Lizzie Tedden Marriage License: This record shows Herman's brother Willie (Frank Privett's uncle) getting married in Desha County on 10/7/1905. This is the last record I have found of Willie, who reputedly died during a flood around 1910. 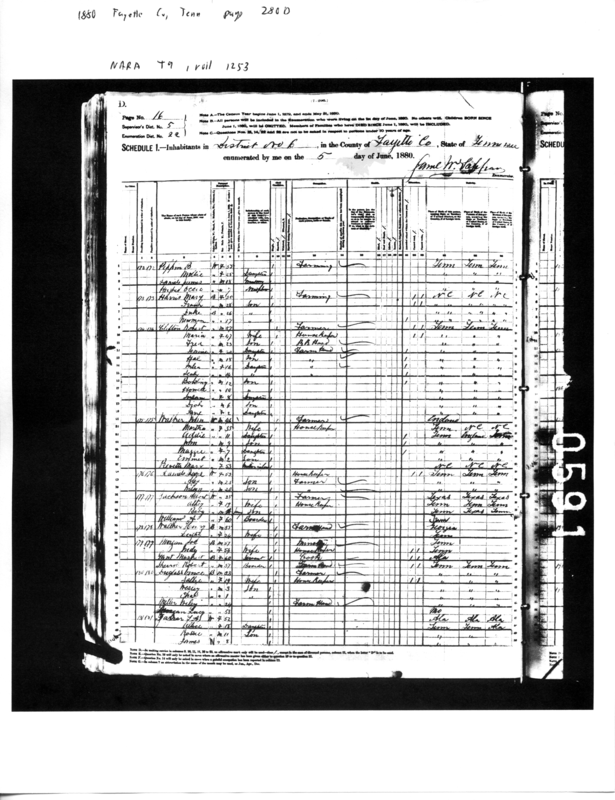 I have not been able to find him in the 1910 census. 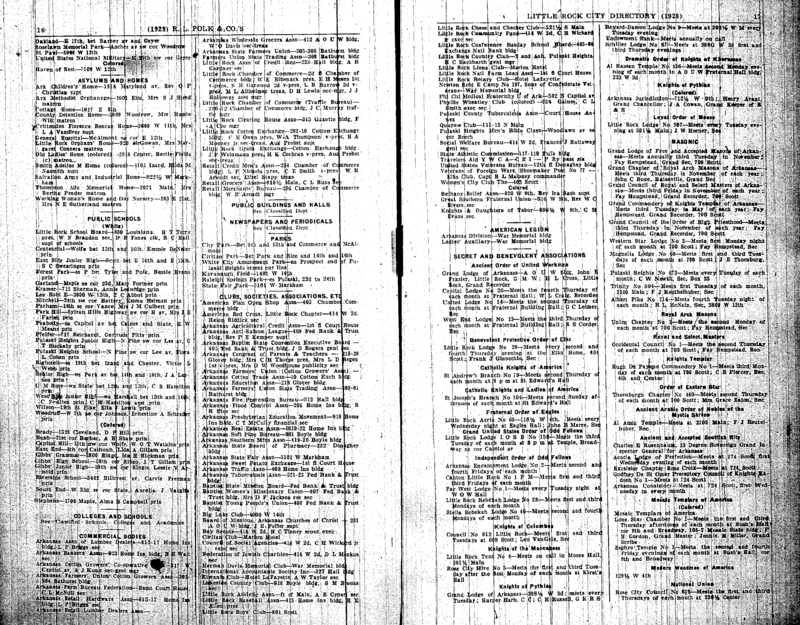 Desha County Marriage Index: This page shows entries for the two Privett men, M.H. (Herman) and W.O. (Willie). 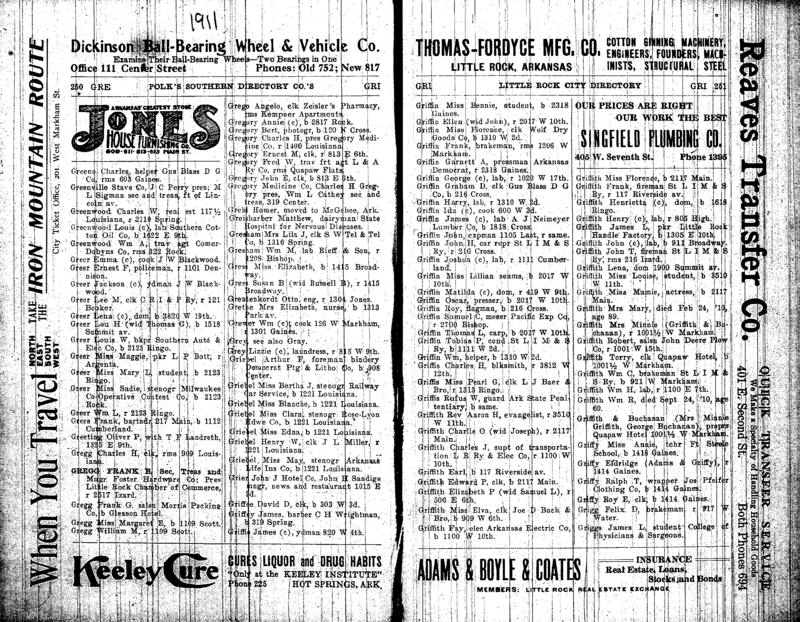 Desha County Marriage Index: This page shows entries for Hattie (Addie) Privett's marriage to Tom Cherry in 1906. 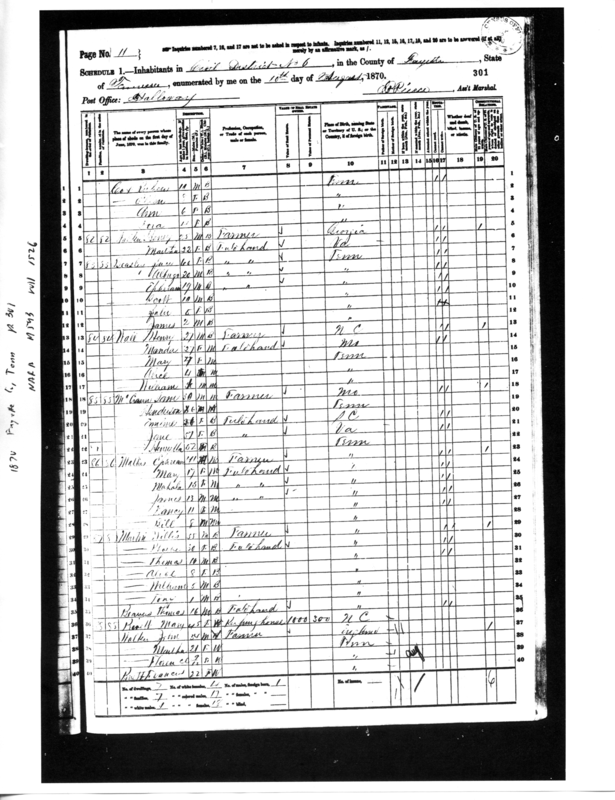 1910 Census: This record shows Herman and Lucinda Privett living with their children, Frank and Elizabeth, in Desha County, Jefferson Township. A third child, Jeff, would come along shortly thereafter. The family would be broken by divorce sometime between 1911 and 1914. The geographic information given on the census page and in the enumeration district is not specific enough to pinpoint an exact location of their residence. 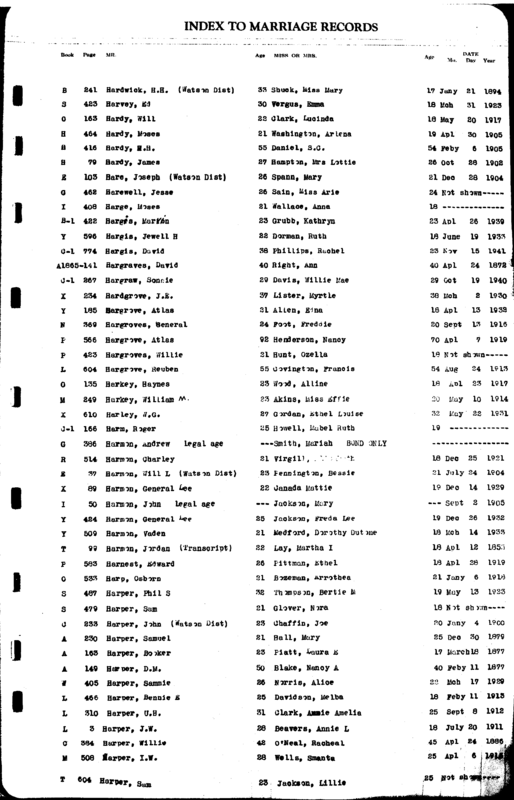 Record is incorrectly indexed as "Hermon Privette". 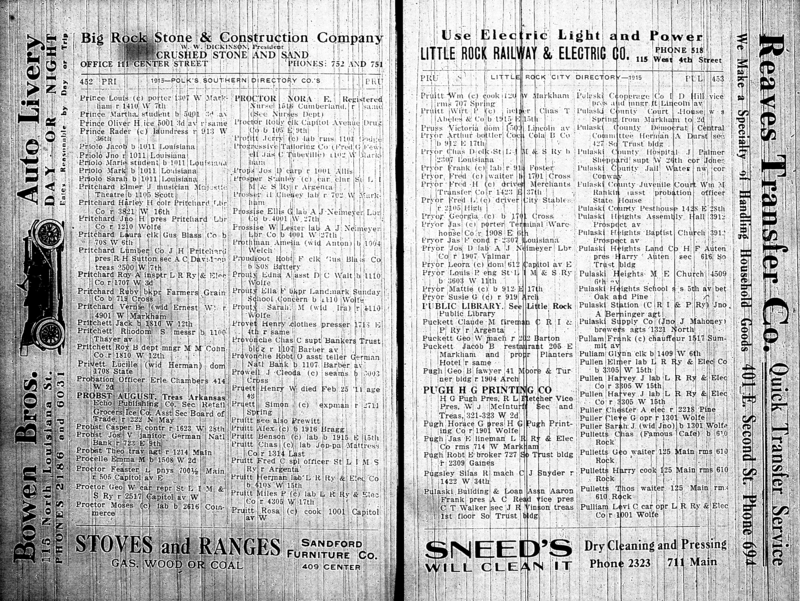 1911 City Directory: Shows Lucinda Privett's future third husband, Pearl Griffis, living at 1313 Ringo Street in Little Rock. 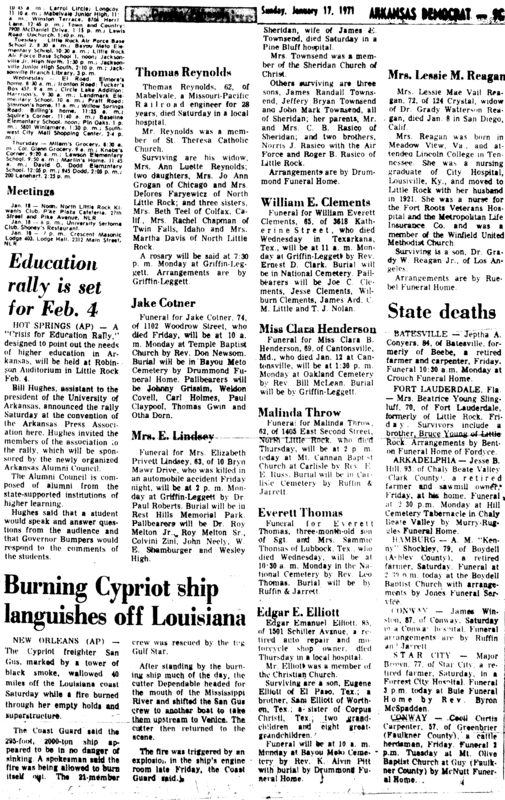 The fact that he is listed as "Miss Pearl Griffis" may demonstrate why he seems to have preferred giving his name as P.G. Griffis and is listed as such on his tombstone. 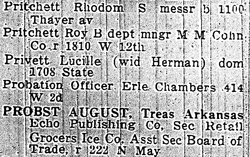 1911 City Directory: Shows Lucinda Privett's future second husband, William F. Irvin, living at 1122 1/2 Main Street in Little Rock. 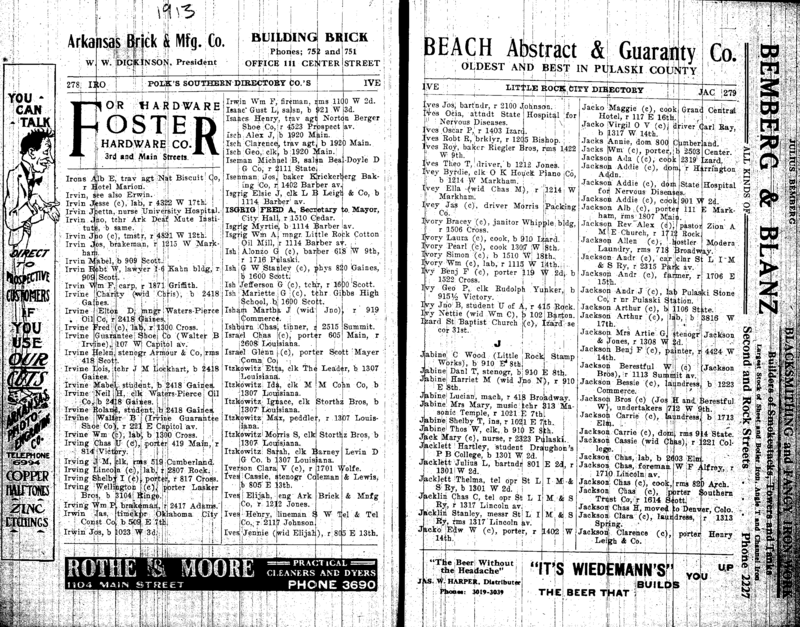 1911 City Directory: After Lucinda and the children left Herman, they went to live with her sister's family, Martha and Ben Staton. 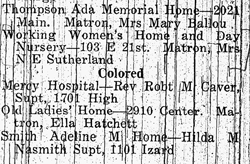 Sometime thereafter, Ben Staton got her placed in the Working Women's Home in Little Rock. 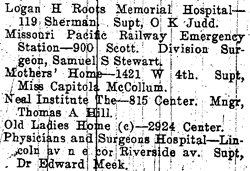 This 1911 City Directory lists the name as "Mothers' Home" with an address at 1421 West Fourth Street, catty-corner from the State Capitol building that was under construction at the time. Since the home moved sometime in 1912 and the exact dates of Privett's residence at the home is uncertain, it cannot be known whether they ever lived at this address. 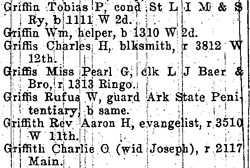 1912 City Directory: Shows Lucinda Privett's future third husband, Pearl Griffis, still living at 1313 Ringo Street in Little Rock. 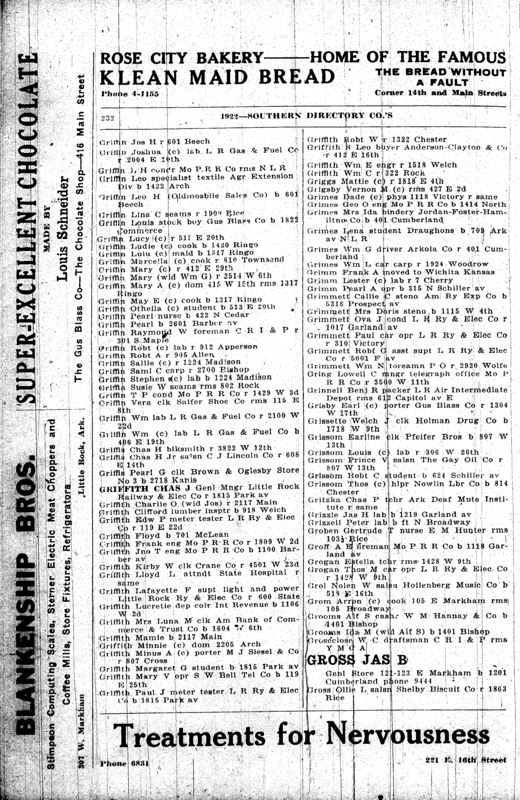 1912 City Directory: Shows the "Mother's Home" renamed the "Working Women's Home" and still located at 1421 West Fourth Street. 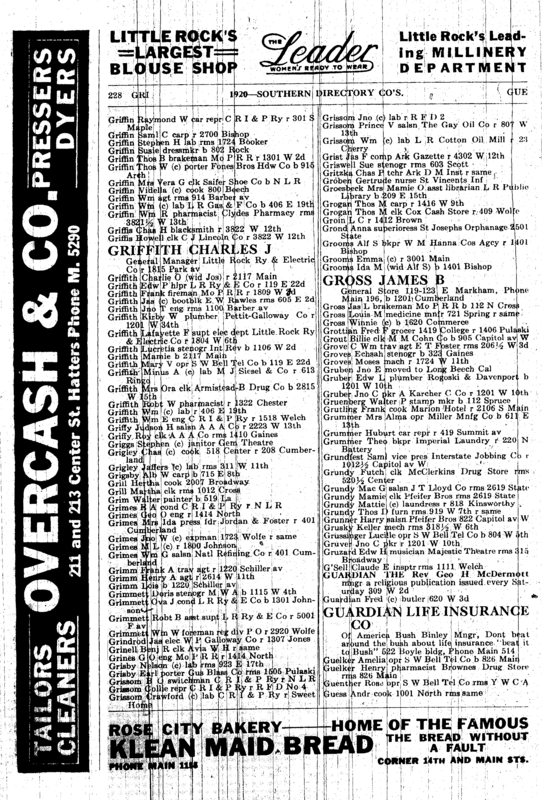 1913 City Directory: Shows Lucinda Privett's future third husband, Pearl Griffis, still living at 1313 Ringo Street in Little Rock. 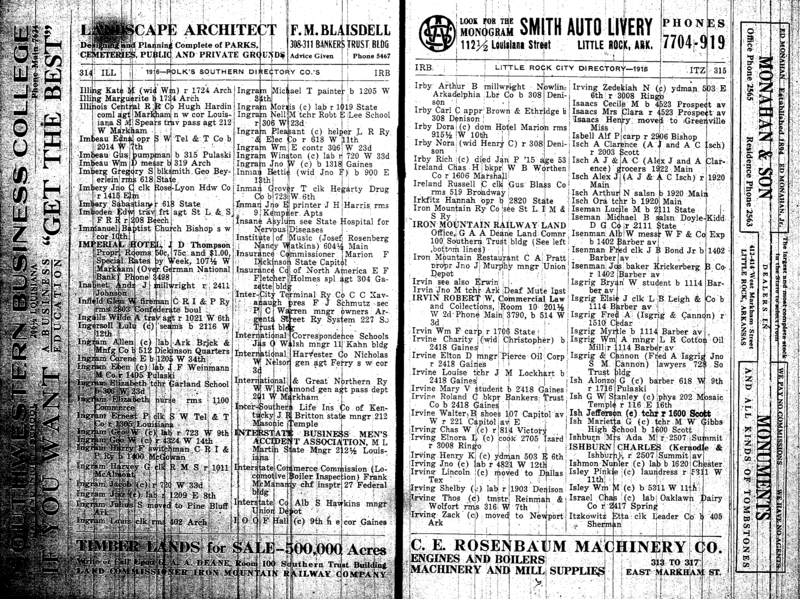 1913 City Directory: Shows Lucinda Privett's future second husband, William F. Irvin, having moved to 1871 Griffith. 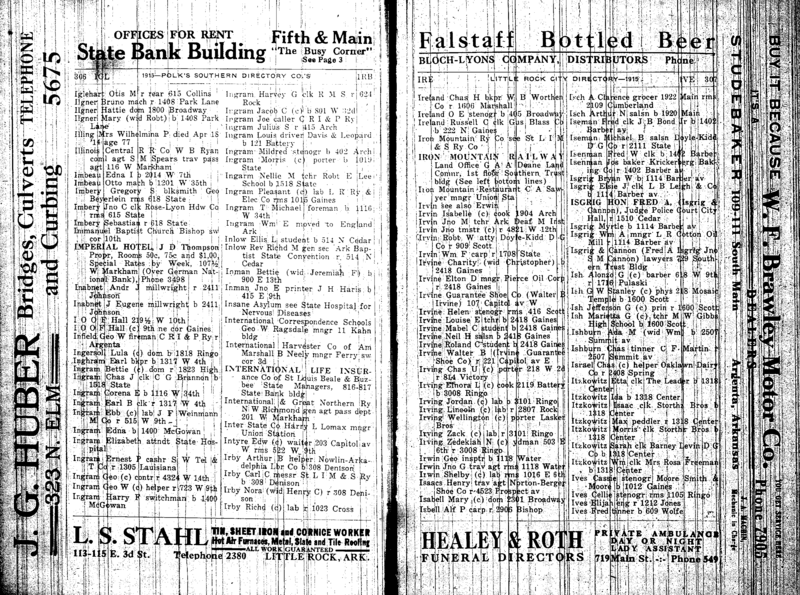 1913 City Directory: Shows the Working Women's Home having moved to a new building at 2106 Main Street and also incorporating a "Day Nursery". 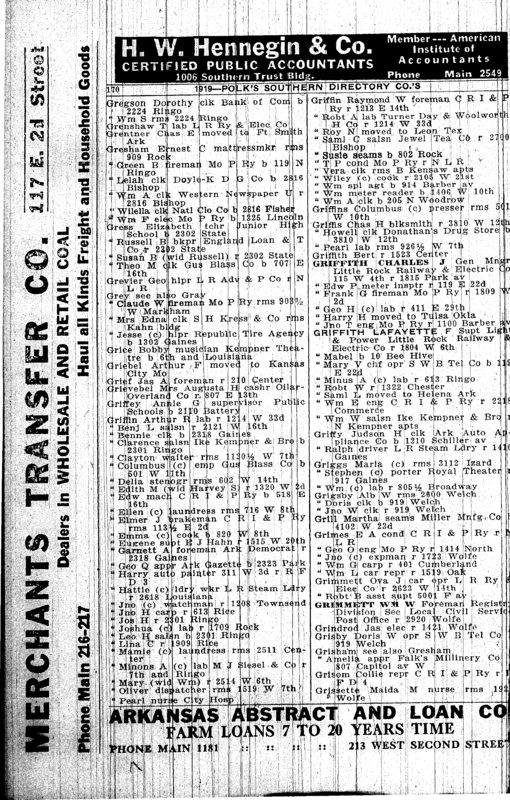 1914 City Directory: Shows Lucinda Privett's future second husband, William F. Irvin, having moved to 1323 Louisiana Street. 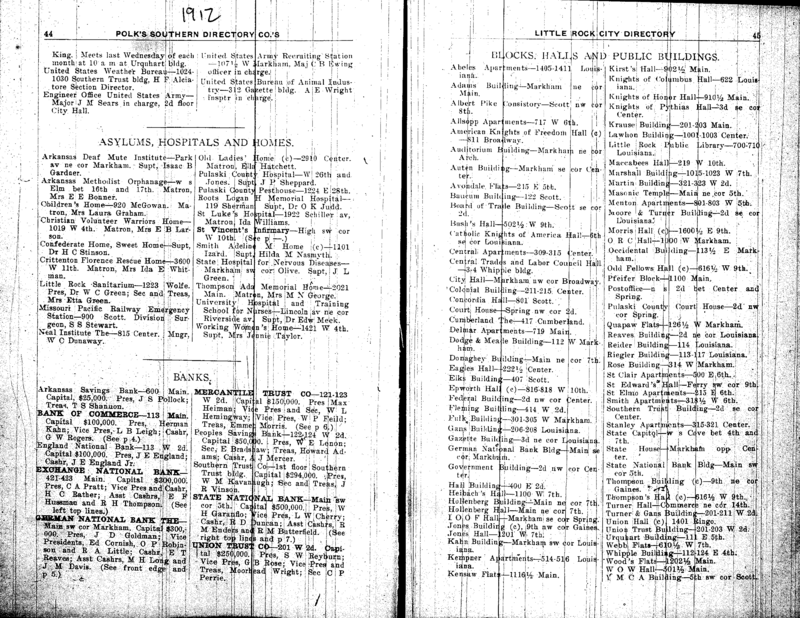 1914 City Directory: Shows Lucinda Privett living at the Working Women's Home on 2106 Main Street. 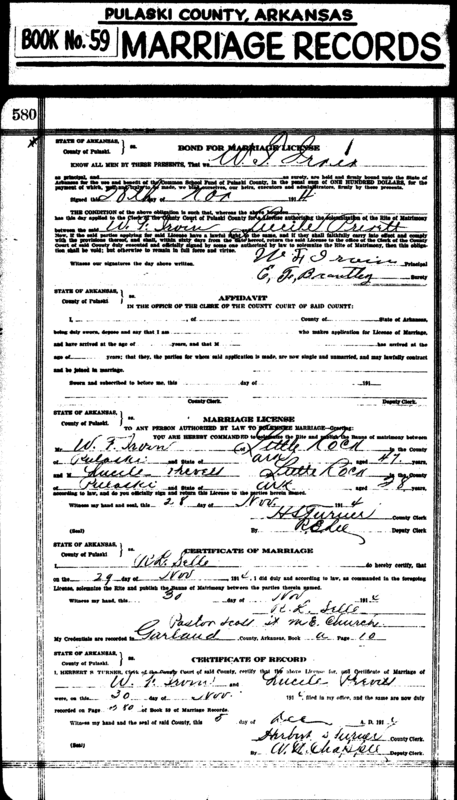 1914 Lucile Privett / William F. Irvin Marriage License: Shows their marriage on 11/28/1904 at "M E. Church". This is the first record in which she gives her name as Lucile rather than Lucinda. 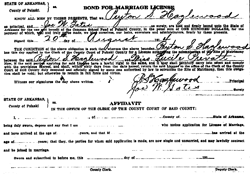 1914 Lucinda Prevatt / Peyton Hazlewood Marriage License: Curiously, there is a marriage license for a Lucille Prevatt on 8/20/1904. 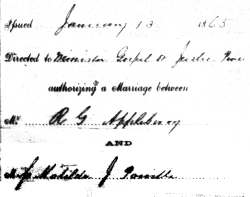 Since this precedes the marriage to William Irvin by only three months, the bride is listed as "Miss", and the last name spelling is different, we can probably safely assume that this is not our Lucinda/Lucille. But it does present the slight possibility that our Lucille was married a fourth time. 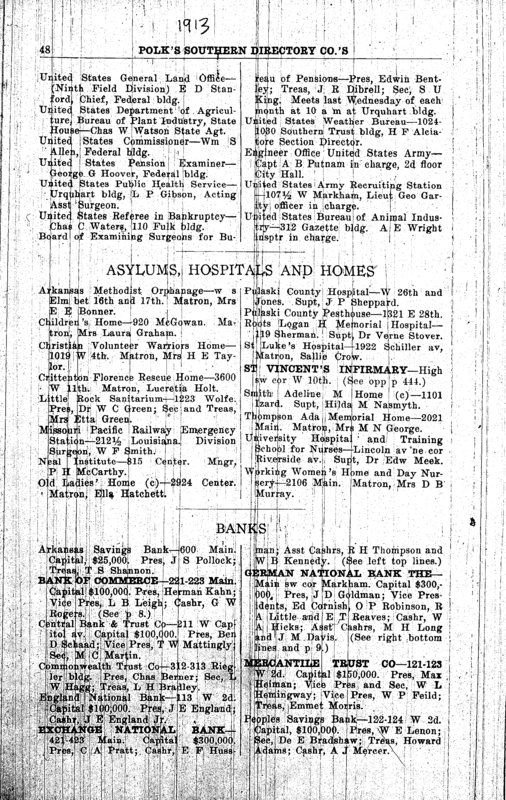 1915 City Directory: Shows William F. Irvin living at 1708 State Street in Little Rock. 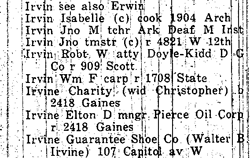 1915 City Directory: Shows a separate listing for Lucinda Privett also living at 1708 State Street in Little Rock, presumably with new husband William F. Irvin and, possibly, their combined six (!) children. 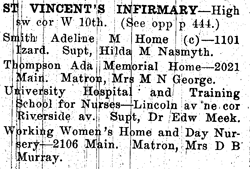 Oddly, she is listed separately from Irvin and also specifies that she is the widow of Herman. 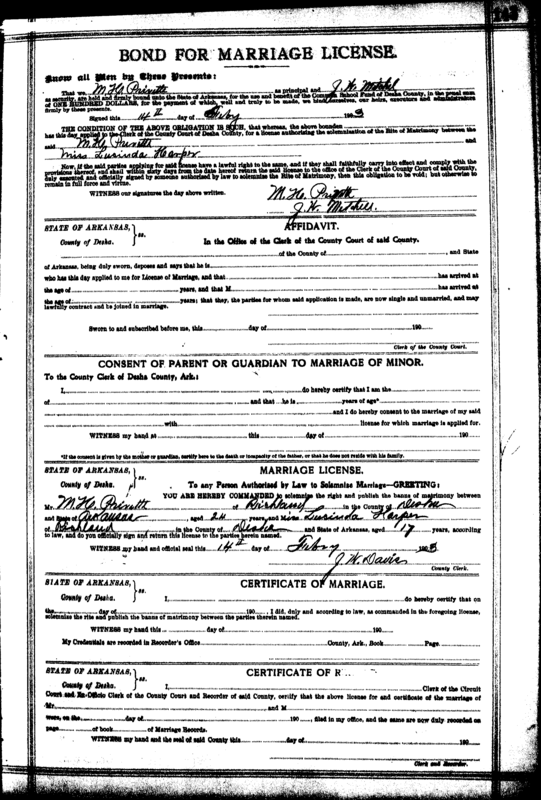 The declaration of widowhood is a lie (presumably to cover the shame of divorce) since, as documented below, Herman was very much alive as late as 1919. 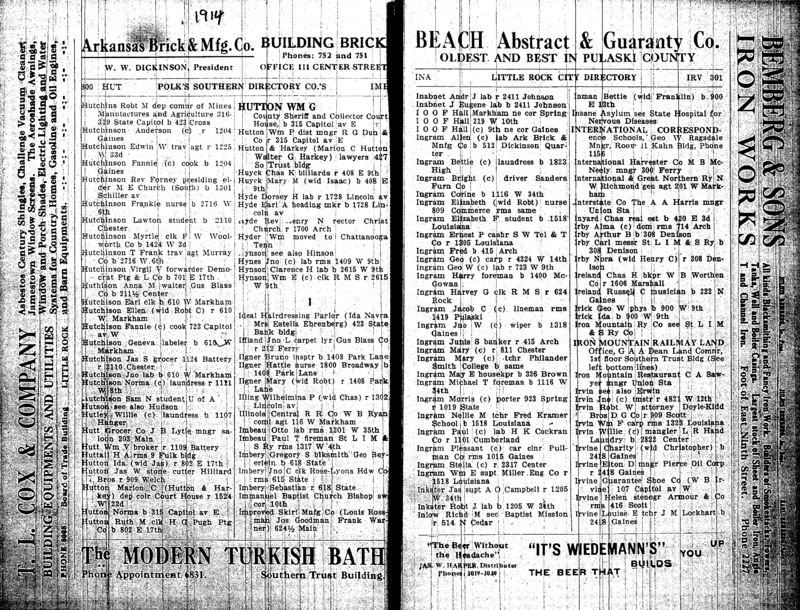 1916 City Directory: Shows William F. Irvin living at 1706 State Street, next door to his 1915 address of 1708 State. We might presume that he and Lucille were still together as there is no separate entry for her in the directory. 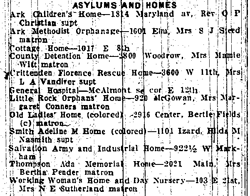 1917 City Directory: Shows the Working Women's Home (which Lucille and the children had, hopefully, long since left) with an address of 103 East 21st Street. This address is the same physical location as 2106 Main Street, although it's hard to know why they went from specifying the address on Main Street to 21st Street. 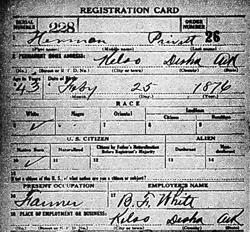 1918 Herman Privett Draft Registration Card: Despite the family legend that Herman Privett passed away around 1915, this card filed in Desha County during World War I indicates that he was very much alive on 9/12/1918. 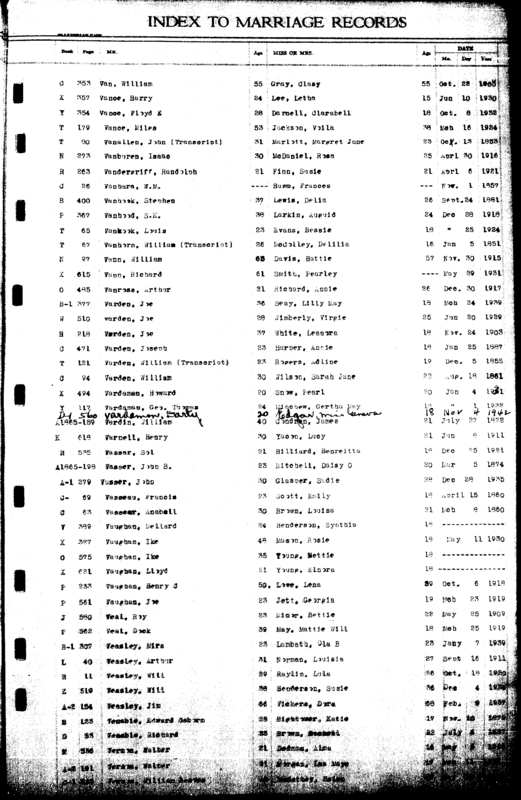 Also curious is that he lists his nearest relative at his son Frank Privett (then 13 years old) and lists Frank as living in Kelso, long after Lucinda and the children had left Herman and moved to Little Rock. 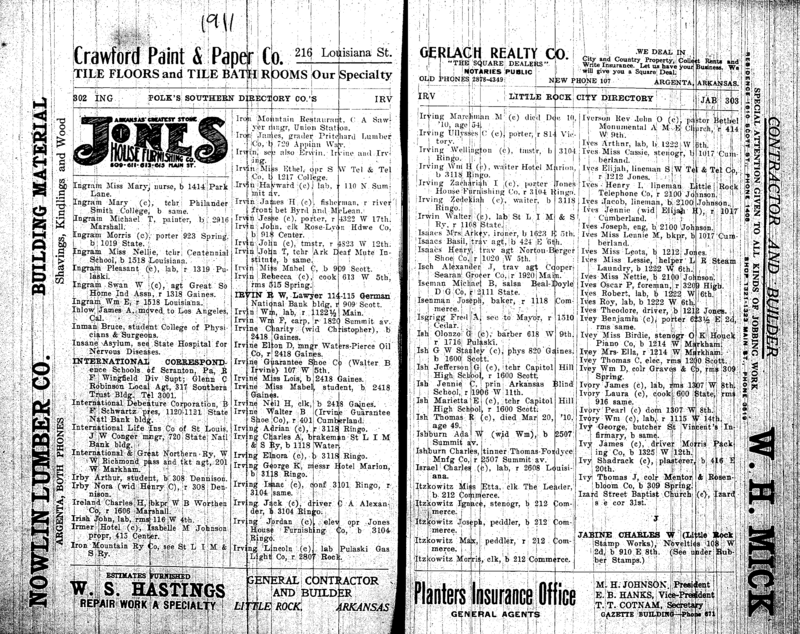 1919 City Directory: Shows Lucille Privett's third husband, Pearl Griffis, living at 926 1/2 West 7th Street. 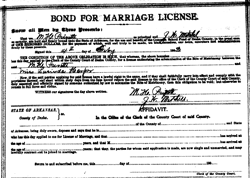 I have been unable to find a marriage certificate for them so it is not possible to know whether Lucille was married to him by this time or whether Frank Privett ever lived at this address. 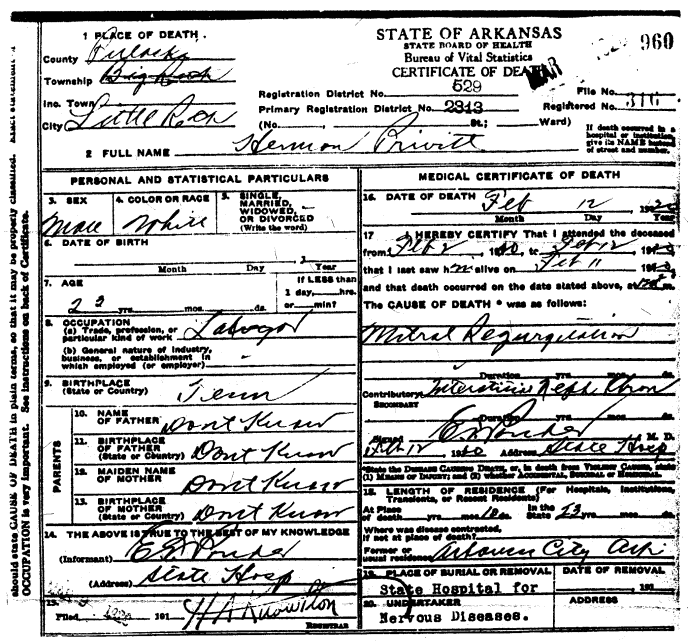 1920 Herman Privett Death Certificate: Herman Privett passed away on February 12, 1920 at the Arkansas State Hospital for Nervous Diseases. The cause of death is listed as mitral regurgitation, a heart condition also known as mitral insufficiency, where blood leaks through the mitral valve, from the left ventricle into the left atrium of the heart. A contributory cause of death is interstitial nephritis chronic, a kidney condition that leads to kidney failure and which might have been caused by alcoholism or ingestion of a toxin. He was buried in an unmarked grave on the hospital grounds. Since the graves were subsequently moved twice, it impossible to know with any certainty where his remains are buried. 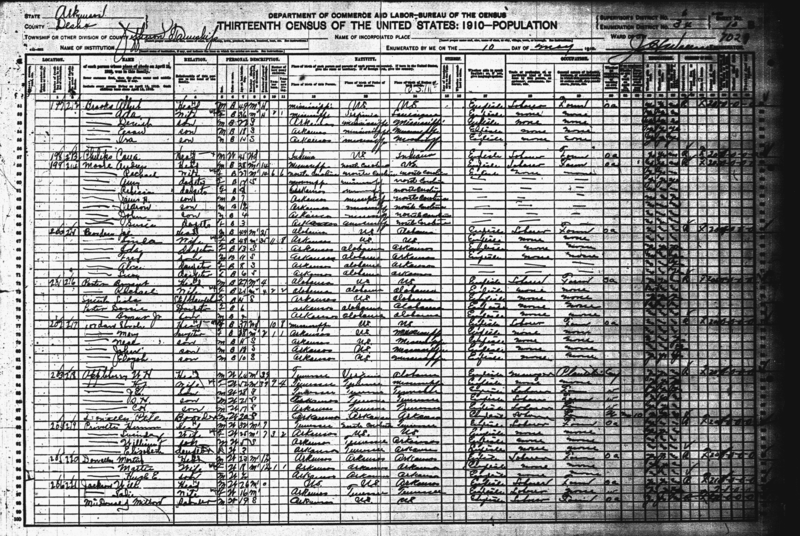 1920 Census: Lists Pearl Griffis as "Gendrige Griffis" living with wife Lucile and the three Privett children. Frank Privett, then just having turned 16, is listed as a laborer working at a stone quarry, his school days now presumably past. 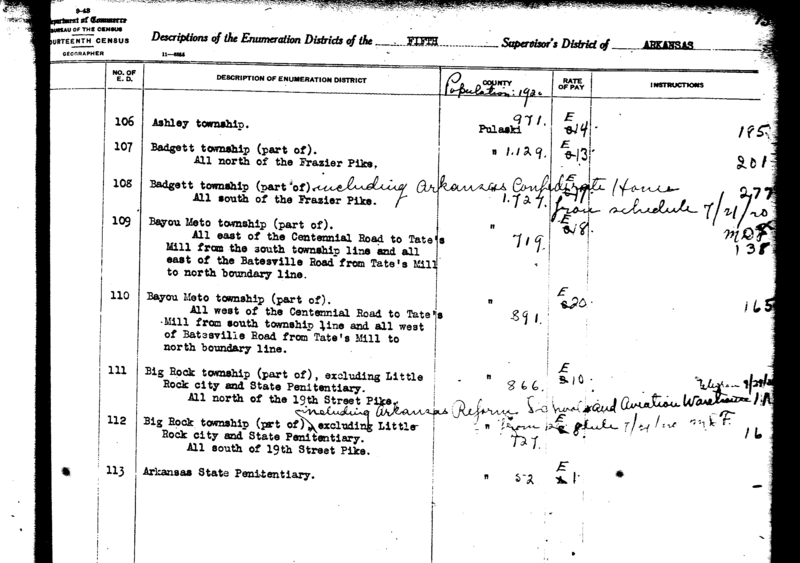 1920 Census Enumeration District: The 1920 Census entry for the Griffis/Privett family gives their residence only as somewhere on 19th Street Pike. The description of Pulaski County Enumeration District 111 only specifies the general area as "Big Rock Township (part of), excluding Little Rock city and State Penitentiary. All north of 19th Street Pike." While not providing much more insight into the specific location of their residence, it does indicate that they were somewhat on the periphery of the city. 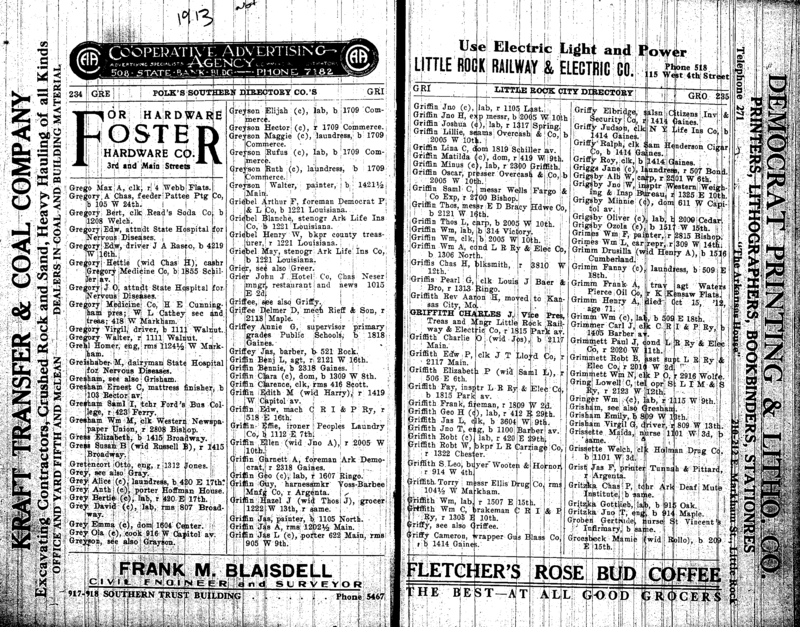 1920 City Directory: Although Pearl Griffis is listed later as living in Little Rock, unfortunately he did not make the 1920 City Directory, which would help clarify their residence at the time of the 1920 census. 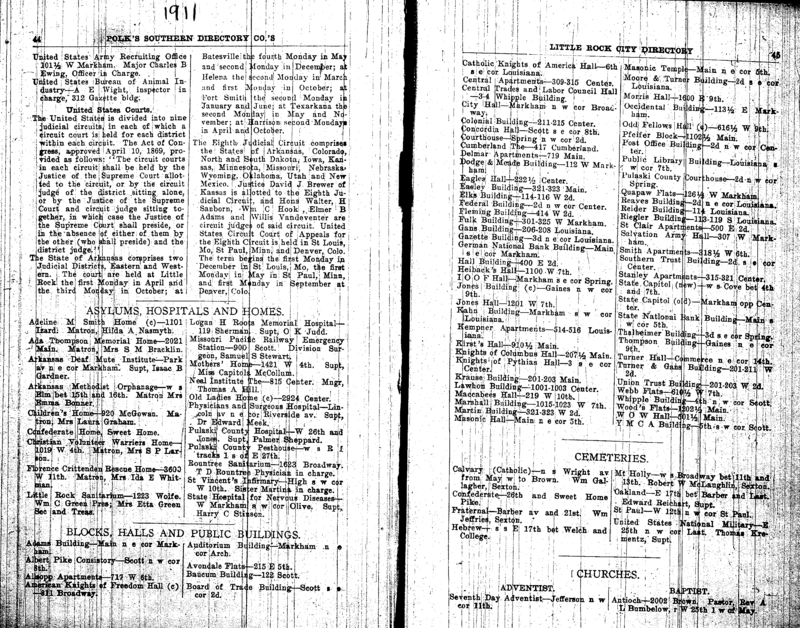 1922 City Directory: Pearl and Lucinda Griffis make a return to the City Directory, living at 2718 Kanis. The current Kanis Road extends West from 12th Street, although it is not possible to know whether the current naming/numbering scheme is the same as it was in 1922. 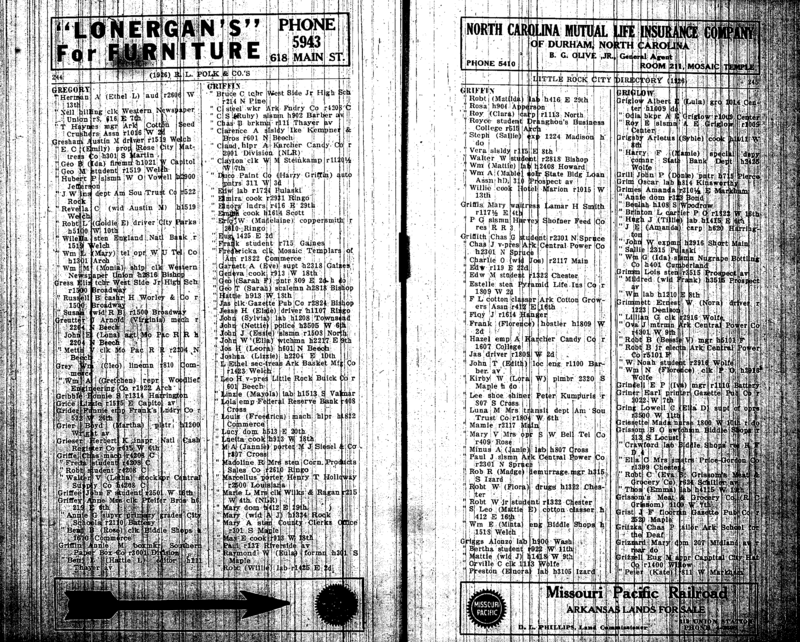 1926 City Directory: Pearl and Lucinda Griffis are listed as living on Rural Route 3, although this may be simply a new designation for the Kanis Road address given in the 1922 Directory. By this time, Frank Privett had long since moved to St. Louis and would soon be married to Eva Morton. 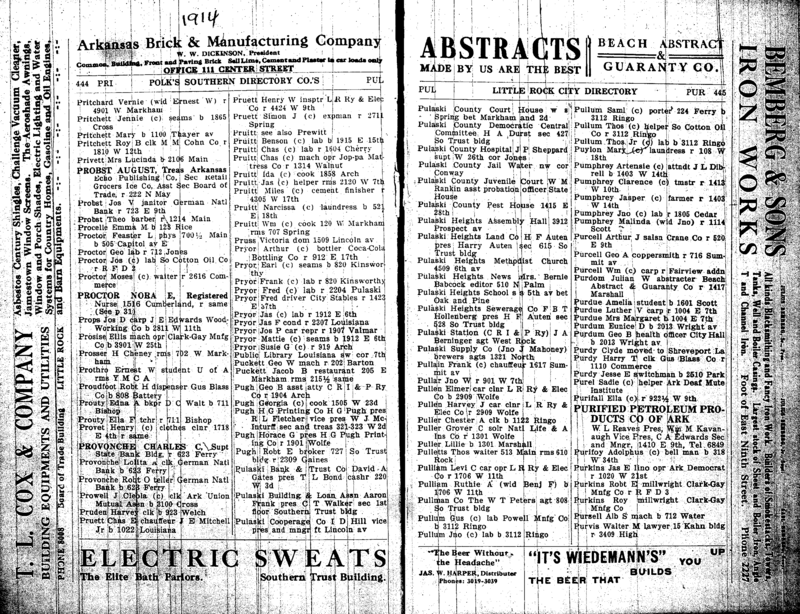 1928 City Directory: The Working Women's Home was not large and, judging from the paucity of documentation, not a terribly significant institution in the life of Little Rock. 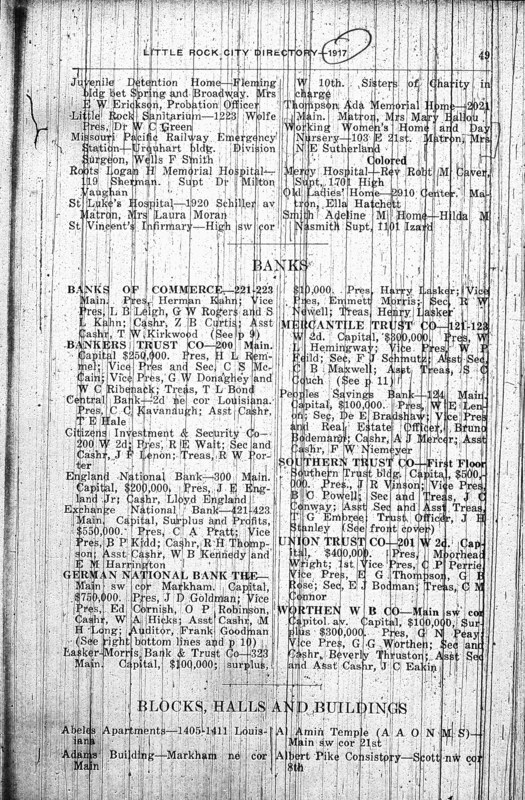 However, it's listing in the 1928 City Directory attests to its longevity. 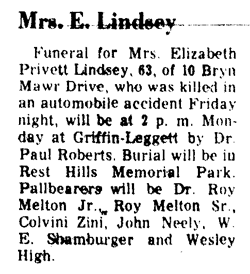 1971 Elizabeth Lindsey Obituary: Frank Privett's little sister Elizabeth was killed in an auto accident on the evening of January 15, 1971. She is interred at Griffin Leggett Rest Hills Funeral Home and Memorial Park, 7724 Landers Rd in North Little Rock, AR, just off Hwy 167.